Powers/Abilities: None. She had a star-shaped birthmark on her left hip. Her life was linked to Zoqquanor's life. If he had died, she would have died, too, but the same spell protected her from physical attacks like blade thrusts. Latterly she came in possession of the powerful protective amulet of Merdoramon. History: (Conan the Barbarian I#50 (fb) ) - Stefanya was born, daughter of Thormond and Chrysala, Lord and Mistress of Phalkar. A betrayal schemed by Themas Herklar, Elviriom and Thalkalides, aided by Samandra succeeded in breaking Merdoramon's protective spells around King Thormond and soon after, in killing Stefanya's mother and father. Samandra didn't want to kill the royal family, so, when Elviriom brought her the infant Stefanya to kill her, she fled from Alkarion. She brought Stefanya to Sfanol, to a conjurer named Zoqquanor. He accepted to protect the babe with his life, in exchange for a great sum of gold. Samandra disappeared and let her two colleagues believe she was dead. (Conan the Barbarian I#46 (fb) - BTS) - In order to guarantee her safety, Zoqquanor cast a curse upon Stefanya, linking her life to his own. If he had died, she would have, too, but as long as he lived she was protected. (Conan the Barbarian I#48 (fb) ) - Zoqquanor raised the girl as a servant, but he also took care of her instruction and education as a highborn child. In his great hall made of stone he performed his magics, things happened that struck terror in the girl. (Conan the Barbarian I#46 (fb) - BTS) - Zoqquanor did not teach sorceries to Stefanya, but sometimes she was used for his experiments. When other guest mages or men-at-arms paid visit to the necromancer, he did not care about their behaviour, so Stefanya had to fend for herself. The girl grew up believing that the conjurer's curse upon her had been casted because Zoqquanor feared she could betray him and kill him in the sleep. (Conan the Barbarian I#46 (fb) ) - But one day, the villagers of Sfanol attacked the castle. Zoqquanor had entered a trance, which resembled death, and had placed Shokkoth of the Many Stones in charge of guarding him. The villagers burnt part of his house and kidnapped Stefanya. (Conan the Barbarian I#46) - Believing that she was a sort of witch, Stefanya was supposed to be burned on a pyre. A stranger, a barbarian named Conan, fought for and freed her. Stefanya convinced him to go to Zoqquanor's castle; she was alive, so Zoqquanor had to be alive as well. There, Conan had to destroy Shokkoth, before reaching Zoqquanor, whose body was untouched in a state of unlife and undeath. (Conan the Barbarian I#47 / Conan the Barbarian I#49 (fb) ) - Conan had to go to Alkarion, to deliver Merdoramon's amulet to Themar Herklar, so Stefanya followed him, but they also transported Zoqquanor's body. (Conan the Barbarian I#47) - That same night, during a full moon, Conan and Stefanya stopped in a dead town with high columns. At midnight, yellow goblins, enemies of Zoqquanor, sensing the conjurer's weakness, came out from the depths of the ruins to attack him. Another of Zoqquanor's enchantments took place. From his body, a silver mist was emitted as defense, but the dwarfish devils were too many. Conan's savage sword reaped their life, while Stefanya defended herself as best as she could. By slaying all imps, Conan saved Zoqquanor. Stefanya thanked Conan with a kiss. (Conan the Barbarian I#48) - After three days of riding westward, the three met Torkal Moh, baron of Ravengard. The cruel baron had Stefanya captured, Conan tied to the ground at the mercy of rats, and Zoqquanor's body thrown down a gorge. (Conan the Barbarian I#49) - Stefanya was imprisoned and tortured. Eventually Conan, with the help of Lupalina and of the villagers captured by Torkal Moh, invaded Ravengard and killed the baron. 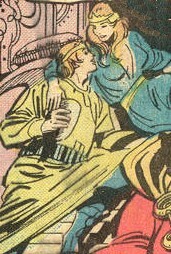 Helped by Gwineer he found Stefanya, unconscious. They went into the garden for Conan had to retrieve the amulet, left on the Gifting Tree. The garden was made of carnivore plants, but they succeeded in reaching the tree, when Pthassiass, the Dweller in the Pool rose! (Conan the Barbarian I#50) - Gwyneer was eaten by the gigantic monster, but Conan managed to push it into the garden, which ate it. Stefanya awoke and when Lupalina saw her, she recognized her as the baby she had saved years before, when she saw the star-shaped mark on Stefanya's hipk which confirmed it her assumption. Lupalina was actually Samandra and soon told Stefanya her true origins. That night, at Lupalina's hut, the sorceress foresaw what awaited Stefanya in Alkarion. They saw Unos, ruling in place of Herklar. Unos, a being emitting an evil greater than Elviriom and Talkhalides. Using the amulet, Conan reached Themas Herklar in the dungeons under Alkarion, but Herklar died, too weakened and wounded. An army of yellow devil-things conjured by Unos went after Conan, who escaped their clutches and swore revenge. (Conan the Barbarian I#51) - Days later, in Alkarion, Samandra and Conan's plan proceeded. They managed to stir up Unos against Elviriom and Thalkalides. The son of demons them slain by his parents, and shortly after, he assassinated Samandra. Without any other obstacle to the throne of Phalkar, except for Stefanya, Unos rode to the princess to kill her. Conan and Stefanya had just retrieved Zoqquanor's body, when Unos reached them. The demons' son felt that he couldn't kill Stefanya with his blade, due to the protective curse, so shot his burning crimson gaze upon Zoqquanor. The conjurer died and Stefanya screamed in agony. Conan killed Unos unwittingly using the amulet, then saved the princess draping the amulet around her neck. Conan left her because she was finally safe, but Stefanya would have exchanged the amulet and her throne, for the heart of the barbarian. Comments: Created by Roy Thomas (writer), John Buscema (pencils), Joe Sinnot (inks), Petra Goldberg (colors). Freely adapted from the novel Kothar and the Conjurer's Curse by Gardner J. Fox. The curse upon her head had made Stefanya mad at the conjurer, even though she admitted he was a good man while trying to convince the villagers of Sfanol not to burn her. While speaking to Conan she also admitted that she sometimes had thought of him as her father. Thormond has no known connections to any other character with a similar name. to any other character with a similar name. Themas Herklar has no known connections to any other character with a similar name. Ayilla has no known connections to any other character with a similar name. Thormond was the king of Phalkar and Chrysala was his queen. Thormond was Lord of Phalkar, and ruled the state well, but when he met Chrysala, princess of another land, and married her, he neglected his duties as King. To protect his family, Thormond had Merdoramon, a good wizard, cast a protective spell upon them. One year after they married, they had a daughter, Stefanya, who was born with a star-shaped mark on her left hip. Meanwhile, Themas Herklar, general of the army, gradually assumed control of the province. He paid Elviriom, Thalkalides and Samandra for helping him become regent of Phlakar, and overthrow Thormond. Samandra managed to break the protective barriers, and two days later, Thormond and Chrysala died in a landslide conjured by the two evil wizards. Themas Herklar was the regent of Phalkar after Thormond's death. (Conan the Barbarian I#50 (fb) ) - When king Thormond ruled Phalkar, Themas Herklar was general of the army. After Thormond married Chrysala, Herklar received control over the province; he saw that the king did not pay attention to the state affairs anymore, so he schemed to overthrow him and take his place as regent. He offered 50,000 dinar gold pieces to Elviriom and Thalkalides for help, but the two sorcerers understood that Merdoramon protected the royal family with his enchantments. Thanks to Samandra's help, the magic barriers were shattered and two days later the king and the queen were dead. Herklar became the new regent. Elviriom brought the infant Stefanya to Samandra, who fled from Alkarion. For many years Herklar ruled rightfully and wisely until Thalkalides gifted him with Ayilla. With Ayilla at his flank Herklar changed, and became more neglectable than Thormond. The responsibility of governing the province were then taken over by Elviriom and Thalkalides. Ayilla brought slave-women to Herklar, who lost interest in the province almost completely. One day Samandra went back to warn him. He learnt then, that his leadership had been taken by murder. 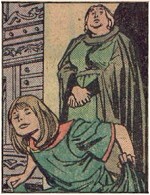 Samandra also warned him that his power was in peril, because the actual leaders were the two sorcerers. Herklar sent away the woman with curses. Some time later, he sent for Merdoramon the mage to get a protective amulet, to protect himself from the wrath of his wizards. (Conan the Barbarian I#46) - Merdoramon gave the amulet to Conan to deliver it to Herklar. (Conan the Barbarian I#50 - BTS) - But in the meanwhile, the wizards had substituted Herklar with Unos, a son of demons. Herklar was imprisoned and tortured. (Conan the Barbarian I#50) - To ensure his power, the wizards and Unos unleashed some hellish creatures in the caves under the prisons, to let them take Themas Herklar. Using the amulet, Conan reached the old man, but could do nothing to save him. Herklar died in his arms before the yellow devils could take him into their netherhell.